Gallo-Teck is a licensed and insured renewable energy specialist which sells and installs micro hydro systems. Our company is experienced in constructing, designing, installing, and troubleshooting micro hydro systems so that your home or commercial property can begin to generate its very own renewable, clean, green energy. Micro hydro systems operate in very much the same way as a large-scale hydro electric system: the combination of the water flow and the vertical drop provides home and commercial property owners with consistent and reliable renewable energy. The majority of customers will use a “low-head” system which has a vertical drop of five feet or less (some may be as small as ten inches). In a “high-head” system, there may be a drop of ten feet or more. These systems offer our customers the opportunity to operate completely off the grid, or you have the option to still be connected to the grid. In many instances you may be able to “sell back” any surplus energy you generate and it will also provide you with reliable backup power in the event of a power outage. Through the use of a programmable logic controller (PLC), Gallo-Teck can create a custom micro hydro solution for projects of any scale. 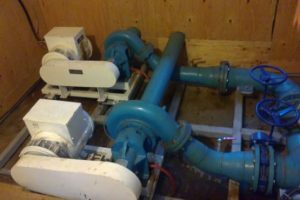 Interested in getting started with micro hydro power or need to have your system serviced? Contact us today to discuss how we can help. Need a custom quote? Contact us and we'll get back to you with a detailed estimate soon. We look forward to hearing from you! © 2019 Gallo-Teck Inc. All Rights Reserved. ECRA/ESA Lic 0007008881, ACP# E-R1840.